"My name is Arliss Michaels. I represent athletes. These are my stories." It is possible that the genre of films about sports agents began and ended with the 1996 blockbuster Jerry Maguire. To be honest what more really needed to be said that had not yet been revealed about the life and trials of a sports agent? It could be argued that the presence of Arli$$, an HBO show that follows the staff of a major firm in the area of sports marketing, is overkill. But to its credit, Arli$$ eschews the trappings of this limited arena and becomes one of the better television series to debut on cable in the last several years. Arliss Michaels (Wuhl) is a super agent and his clients include athletes from every conceivable sporting field. His office is filled with a cast of characters that offer help as well as trouble, including his personal assistant Rita Wu (Oh), business partner Kirby Carlisle (Turner), and his financial adviser Stanley Babson (Boatman), each of whom have a specific role in the landing of clients and the never ending task of keeping them happy. Add to the cast a large group of cameos from numerous sports figures and other celebrities, as well as some truly startling serious issues pertaining to real world of sports management, and you have a great team. What makes this series marginally better than others on television is the way in which it caters to both the ardent sports fan as well as even the most casual sitcom viewer. The series also deals with conflicts of conscious and weighs such heavy issues as accusations of sexual misconduct aimed at those in the public spotlight, but includes something as heartwarming as Arliss' encounter with his boyhood hero whom he helps to get back on his feet. Arli$$ does not always meet with this level of quality as often times the episodes divert into raunchiness, helped by the lack of censorship on HBO. These moments are timed well enough with the more tender moments as to not seem repulsive, but often times they seem merely an opportunity to push the envelope. 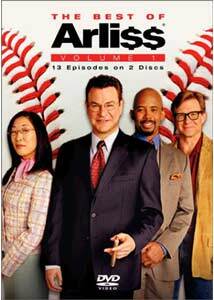 The episodes included on The Best of Arli$$ include a variety of selections culled from the series' six year run: The Stuff Dreams Are Made Of, Cause and Effect, The Changing of the Guard, The Art of Give and Take, Making Things Happen, Last Call, Setting Precedents, The Immortal, Playing It Safe, Moments to Remember, End Game, and All That Glitters. Though the set gives even the most casual viewer a nice feel for the series overall, the collection fails to offer a great knowledge of the series. While some shows lend themselves to this sort of release format (I am not advocating this in anyway to be sure), Arli$$ is a show that requires the viewer to fall into the rhythm of the characters while seeing them grow through the progression of a season. Image Transfer Review: Each episode is presented in a full-frame transfer faithful to their original aspect ratios. Colors are nicely done with no bleeding evident and nice vibrancy and depth. Sharpness and detail are each nearly perfect. The transfer is in line with other television releases, though I would have liked it to have been a bit better. Audio Transfer Review: The Dolby Surround track is uneventful in its construction as the dialogue is the true star of the mix, and it sounds crisp and clear throughout with no dropouts. The left and right speakers as well as the surround speakers are mostly dormant. Extras Review: The lone extra feature for The Best of Arli$$ is a commentary track for the episode Moments to Remember by Robert Wuhl, Jim Turner, Sandra Oh, and Michael Boatman. The track offers no real insight into the making of the series, but the group certainly exhibits a nice chemistry and their energy is addictive. While a full season set would be terrific, The Best of Arli$$ will satisfy those looking for a quick fix when it comes to the series. Recommended.